the Garfield Park swimming pool, which has been closed since 2002.
playground equipment on the site. Manager Greg Sundstrom’s strategy to transform city government. equipment and personnel to remove the pools and decks, Sundstrom said. mixed feelings about the plan to remove the pool. repairs in its current budget. 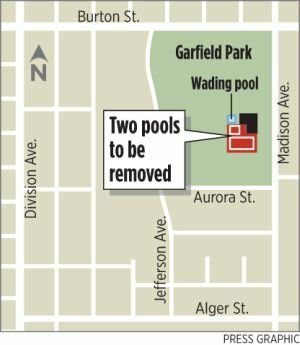 large pools at Garfield Park that have been closed since 2002.
not pass state inspections, Steffen said. swimming pool half a mile away from Garfield Park in October.